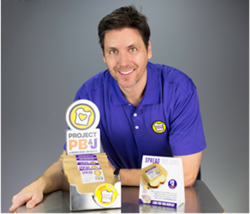 Which Wich, an award-winning, national, fast-casual sandwich concept, plans to feed 100,000 people in need by making and donating peanut butter and jelly sandwiches to local organizations across the country on April 2nd, 2015 as part of the brand’s Project PB&J® program. The event will be taking place at Which Wich restaurants across the U.S.
Each local Which Wich owner has committed to making and donating at least 100 peanut butter and jelly sandwiches to a local nonprofit. Some of the organizations that Which Wich is partnering with include local Boys and Girls Clubs, homeless and emergency shelters, and transitional housing centers. The Spreading Party is linked to Which Wich's philanthropic campaign, Project PB&J, where for every PB&J bought, one is donated to a local organization and another is banked in the brand's global fund for emergency situations. The company currently has locations in 38 states and the United Arab Emirates, Mexico, Panama and Guatemala. Which Wich is rapidly expanding and territories are available across the United States with a heavy focus in the Chicago, Phoenix, Salt Lake City, Las Vegas, New Orleans and DC-Baltimore areas for growth. The brand is also looking forward to expanding internationally in 2015, with openings in Qatar, Bahrain, Kuwait, Lebanon and Saudi Arabia. To learn more about the Which Wich franchise opportunity, please click here. Which Wich® Superior Sandwiches was founded in Dallas in late 2003 by restaurant entrepreneur, Jeff Sinelli. The national sandwich franchise chain is best known for its customizable sandwiches, creative ordering system, and personalized sandwich bag. In 2014, QSR named Which Wich one of their "2014 Best Franchise Deals" and Forbes listed Which Wich as one of their 2014 “30 Best Franchises To Buy". Which Wich currently has 400 locations open or in development in 38 states and eight countries. For more information, visit http://www.whichwich.com. Which Wich’s Project PB&J® program aims to aid in the fight against hunger by allowing customers the chance to participate in the donation of peanut butter and jelly sandwiches to organizations in local communities who provide food for those in need. Which Wich founders, Jeff and Courtney Sinelli, share a love for the PB&J sandwich and after supporting hundreds of charitable causes over the last decade, Jeff and Courtney wanted a more direct path to helping people. It occurred to them that maybe they could change the world by giving away PB&Js. Project PB&J® was started in January 1, 2014 to bring comfort and comfort food to those in the world who need it; to let them know someone out there cares. From those affected by natural disasters to local organizations, Project PB&J is trying to bring a smile to the face of those in need and a meal to their belly. Now Project PB&J is featured in every one of our nearly 400 stores across the country. When you buy a Project PB&J sandwich, you're helping in three ways. You get a sandwich, which you can give away or gift if you're not in the mood for PB&J. Which Wich® gives a second PB&J sandwich to a local organization that could use a little love. And Which Wich banks a sandwich to help the world during times of greater need. Spreading Parties were born out of a sense of camaraderie, attempting to make even bigger impact in our communities. From 20, to 500 people, Spreading Parties are a way to come together and make thousands of PB&Js in one room, together. Join us at LEAP 2015, where we will attempt to break the World Record and join forces to make 22,000+ PB&Js to donate in greater Dallas-Fort Worth! For more information, visit http://www.projectpbj.com.